Three Iowa Democrats — Senator Tom Harkin and Congressmen Bruce Braley and Dave Loebsack — were among those invited to the White House today to watch as President Obama signed the health care reform bill into law. 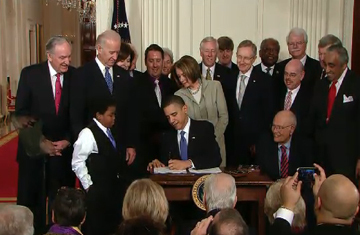 Sen. Tom Harkin (far left) looks on as president signs bill. Republicans propose legal action to try to halt implementation of the plan. Congressman Steve King, a western Iowa Republican, says the fight over health care is far from over. Congressman Braley, who is an attorney, said few of these kind of legal challenges have been successful. “There is a strong presumption in the constitutionality of what congress does,” Braley said. Obama today called the health care bill an “extraordinary achievement” and he said congressional Democrats “did what was right” in passing the legislation. Braley was among a handful of negotiators who worked into the early morning hours of Saturday, hammering out key details of the package.